Hope everyone had a great weekend enjoying the fall weather. Now that the weekend is over, here are the latest social media updates you should know about. 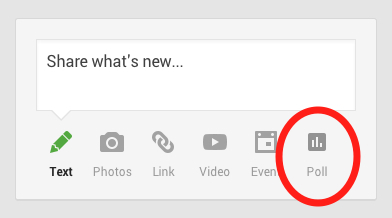 Google+ Adds Polling Feature: Google+ added polling to give users another means to be social and engage their followers. Google+ polls are very simple – allowing only five choices and personalization using photos. Photos added to polls can only be uploaded directly from Google+, mobile storage, or Google image search. Facebook Releases Local Awareness Ads: Facebook has made it easier to market locally with the introduction of local awareness ads. The ads can be targeted to people local to a business or organization. The ads require marketers to enter their business address and choose the radius within which people should see their ad. Local awareness ad will roll out over the coming weeks in the United States and internationally in the months thereafter.